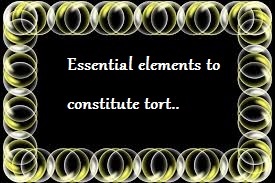 Home » Law of Tort » Essential elements to constitute tort.. Lets see what are essential elements to constitute tort..
2) This wrongful act must have resulted in legal damage of plaintiff, i.e. injury to legal right of plaintiff. 3) There is legal remedy in the form of an action unliquidated damages. In order to make person liable for tort, he must have done an act which he was not expected to do, or he must have omitted to do something which he was supposed to do. Wrongful act is a act which is contrary to the provisions of law,thereby causing injury to the legal rights of another ,e.g. A commits the act of trespass is liable for trespass, or publishes a statement defaming another person is liable for defamation or wrongfully detains another person is liable for false imprisonment . Similarly when there is a legal duty to do some act and person fails to perform that duty, he can be make liable for such omission. The wrongful act or wrongful omission must be recognized by law. Therefore a mere social or moral wrong is not enforceable, e.g. if somebody fails to help a starving man or save a drowning child is only a moral wrong hence not liable. In this case a corporation fails to put proper fencing to keep the Children away from a poisonous tree and a child plucks and eat the fruits orchestra the poisonous tree and dies, the corporation be liable for such omission. In this case employer failed to provide a safety belt for safe system off work liable for consequence of such omission. A plaintiff has to prove that there has been a legal damage caused to him it is nothing but an injury to the legal right of the plaintiff thus plaintiff has to prove that there was a wrongful act or omission on the part of defendant, causing thereby breach of legal duty or violation of legal right of the plaintiff vested in him and recognized by law. Therefore, there can be no action under the law off tort unless there has been violation of legal right or plaintiff. Hence violation of legal right is actionable. it is immaterial whether plaintiff suffered by any loss in terms of money or not. This provision expressed by the maxim "injuria sine damno" means injury to the legal right off plaintiff caused by defendant without any loss in term of money to the plaintiff. Since what is actionable is the violation of legal right,it therefore follows that when there is no violation of legal right , no action can lie in the court of law even though defendants act has caused some loss of harm or damage to plaintiff. The wrongful act of the defendant must come under category of wrongs for which the remedy is civil action for damages. The essential remedy for tort is an action. For damages but there are other remedies also, e.g. injunction obtained in addition to damages in certain cases of wrong. The law of tort is said to be a development of maxim "ubi jus ibi remedium" that there is no wroit without a remedy. If a man has a right he must of necessity have a means to vindicte and maintain it and a remedy it it is injured in exercise or enjoyment of it. It is in vain to imagine right without remedy. Thus where there is no legal remedy, there is no legal wrong. If out of above three elements ,any element is absent or missing, then there is no tort. Wrongful act and legal damages goes hand in hand. Legal damage means violation or infringement of legal right.